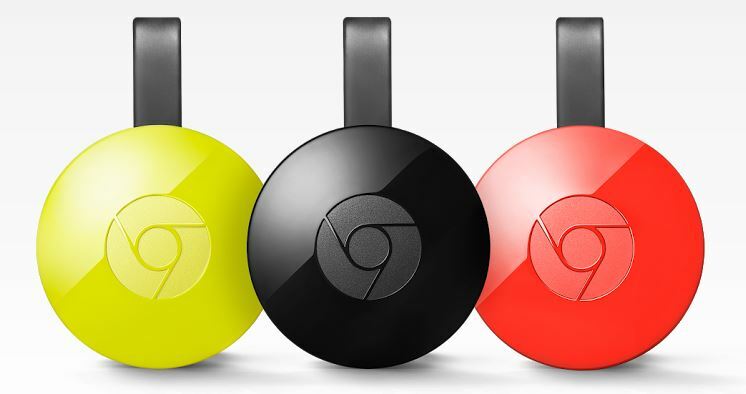 Google launched the highly anticipated updated Chromecast today during their 2015 Sept event which is available for sale right now at their site. 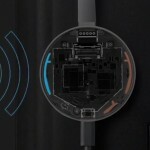 This may not have been a surprise as Chromecast has been a huge hit and it was due for a hardware update since it was first launched July 2013. What was surprising was the launch of Chromecast Audio. Chromecast Audio plugs into the back of your speaker using a 3.5mm jack which you can stream directly from your Android device (phone or tablet) to your speakers. Previously, you had to stream via your TV which is connected to your TV which didn’t work well for people who only wanted to stream music. Now you have an option. The content streaming market is heating up with Amazon’s updated Fire TV and Apple’s own Apple TV. I will do a side by side comparison shortly! First, the new Chromecast is updated with new software and hardware with new colors – black, coral, and lemonade. One thing that did not change is the price. Google went away with the dongle and redesigned Chromecast and now looks like a hockey puck. The Chromecast will have a built in HDMI extension which will make it easier to connect to your TV. Another major change is the improvement in WiFi. The Chromecast will now support 802.11ac and 5Ghz bandwidth as well. It also has built in adaptive antenna system to maximize WiFi signals which has plagued a lot of people in the first generation Chromecast. 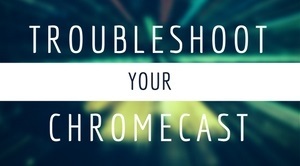 New Chromecast also has capability to cast more data resulting in less buffering. 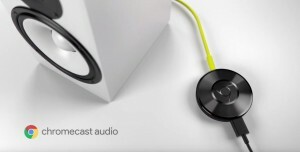 Chromecast Audio looks similar to the Chromecast except it has vinyl-esque grooves on the top. 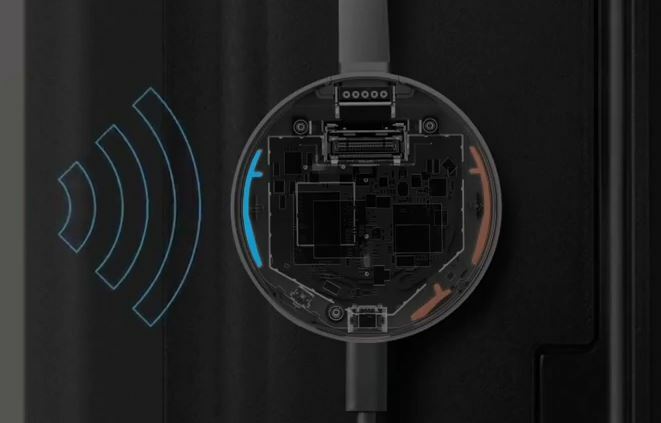 There aren’t too much details on Chromecast audio but it does have a 3.5mm audio jack as well as RCA and optical connector. It also has the adaptive WiFi antennas used to maximize the connection and quality of the music. Through Chromeast Audio, you can make your speaker “smart”. 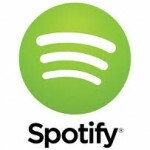 Link this in with apps such as Google Music, Pandora, or Spotify, then you will be able to stream seamlessly. When you click the cast button from these apps, you will see a speaker icon to cast to which will be your Chromecast Audio device such as below. For the time being you cannot cast to multiple audio devices. This will eliminate the need to use bluetooth where you need keep your keep your phone running at all times and all relating notifications gets sent over. 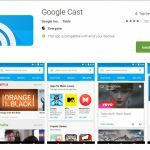 Existing Chromecast app was limited to setup, backpage, and maybe looking for offers. The new Chromecast app has more features. Google has incorporated content discovery feature called, “Whats On”. Through this, you can review content that is trending or live events which may interest you. There is a new tab which will allow you to remote control different devices seamlessly as you go through different rooms. 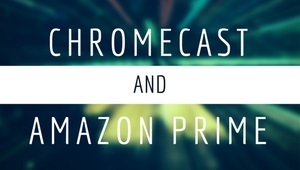 Will allow you to search within installed Chromecast supported apps or introduce you to new apps. You can also search related content from apps such as Youtube or other apps. This new feature pre-loads app data as you open the app which will aid in reducing load time by up to 80%. It also pre-loads the following episode which you are likely to watch as you have finished watching one episode. Google simulated this for Netflix but will enable this for all partners. 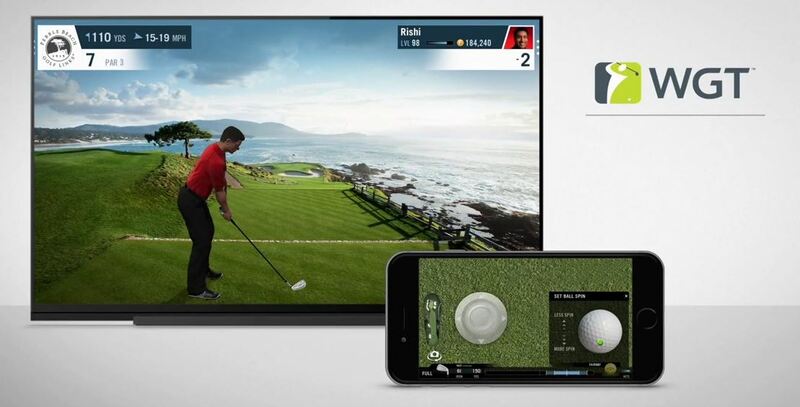 Google released a remote display API for Apple and Android based mobile devices. This will allow developers to update game apps so you can play using your TV with one screen and for example set up the game controller on the mobile device. You can also play simultaneously with other players such as Monopoly where each device will have the players own screen. Good Bye Chromecast, Hello Google Cast! This entry was posted in News, Setup and tagged audio, chromecast audio, coral, devices tab, fast play, get app, google live event, google what's on, lemonade, new, new chromecast, sept 2015 event, whats on on September 29, 2015 by CC Administrator.